Base of Operations: Extradimensional realm, possibly the dimension of Raggadorr. Powers/Abilities: Denak has vast knowledge and power over magic forces at a level comparable to deities. Denak sometime grants his power to mystics and magic users who mainly invoke his demons. Some enchantements involving his power are: the "Disks of Denak", flat, purple disks that fly from the hand as Eldritch Crystals of Incredible power rank; the "Demons of Denak" a spell that summons a moltitude of demons to obey to the sorcerer's will. The exclamation "Demons of Denak!" is not a simple interjection but considered a curse, it is rather common to be heard in dreadful, surprising and dangerous situations, it is unknown if its pronounciation serves also as a general form of exorcism against the threat forthcoming. Not all the uses of the "Demons of Denak" power were directed to evil purposes, in some cases it was used to dispel other enchantements and to restore magic objects to its original form; the "Daggers of Denak", a whirling wheel of cutting magic blades, effective in physical attacks or defenses. (Strange Tales I#149 (fb) - BTS) - Denak and his demons were creature of darkness, and lived in a dimension beyond the farthest reaches of the universe, a Nameless dimension, "The Place which is not a Place". (Doctor Strange: Sorcerer Supreme#48 - BTS) - As many other powerful mystic beings, Denak was involved in the War of the Seven Spheres, a Pan-cyclic conflict between magic entities which will endure for 5000 years. (Strange Tales I#149) - Some demons of Danak, summoned and driven by the evil Kaluu, were banished by Doctor Strange using the light of the Amulet of Agamotto. (Doctor Strange: Sorcerer Supreme#49) - Denak, looking for a champion to fight for him in the War of the Seven Spheres, wanted to enslave Strange, because of the many times he granted his help to the sorcerer to cast his spells. So, he reached the dimension where Dr. Strange was. There, he found that many other mystic entities sought for the sorcerer's services: the Vishanti, who he considered his enemies, and also Cyttorak, Watoomb, Ikonn, the Seraphim, the Faltines, Munnopor, Raggadorr, Satannish and Valtorr. Unable to fulfil none of the requests, Strange invoked the Law of Emancipation, refusing to serve Denak and any other being in their multi-dimensional war. Denak and the other mystic entities then, had to accepted Strange's denial of service, so hurled him back to the Earth but negated him any help in the future. (Doctor Strange: Sorcerer Supreme#80 (fb) - BTS) - Denak presumably participated in the War of the Seven Spheres, but how active a roll he took and for which side he fought is unrevealed. 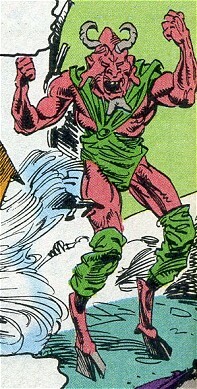 Denak's name was first used in a spell by Stan Lee. Form revealed by Len Kaminski (writer), Geof Isherwood (pencils), Petrecca & Hudson (inks), George Roussos (colors). In Doctor Strange III#59, Strange revived Pura-Shamutra, one of the entities involved in the War of the Seven Spheres, whose death had caused a cosmic unbalance and had seriously damaged the tissue of the Universe. Strange convinced Pura-Shamutra that the War could lead to the annihilation of everything and that the annihilation was probably the purpose of the Trinity of Ashes. Pura-Shamutra promised to intervene to stop the destruction. Instead, in Doctor Strange III#80, Strange revealed that he had fought BTS in the War and that he had regained the favor of the Vishanti (and, probably, Denak's favor, too). Denak received an entry in the Manual of Misticism by TSR. 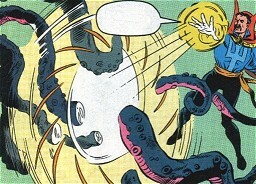 There, it is stated that one of his aliases is Danak, as shown in Strange Tales I#149. Also, in Defenders I#113, a spell casted by Strange, involved the "shrieking" demons of Denakk, which is another alias of Denak. Still in the Manual of Misticism it is supposed (as seen in Strange Tales I#157) that that the Demons of Denak (and, I suppose, Denak, too) were originated in the dimension of Raggadorr, a place also referred to as Nameless Dimension and "the Place which is not a Place". my cloak now rise -- restored!! now be these bands dispelled! let Clea remain entranced , that she may tell me that which I would know! e anche il Satannish stesso...! Doctor Strange II#11: Exclamation: By the Demons of Danak! Defenders I#38: Exclamation: Demons of Denak! Defenders Annual#1: Exclamation: Demons of Denak! Doctor Strange II#16: Exclamation: Demons of Denak! Doctor Strange II#18: Exclamation: Demons of Denak! Doctor Strange II#20: Exclamation: Demons of Denak! Exclamation: By the Demons of Denak! Doctor Strange II#23: Exclamation: Demons of Denak! Doctor Strange II#24: Exclamation: By the Demons of Denak! Man-Thing II#4: Exclamation: Demons of Denak! Doctor Strange II#42: Exclamation: Demons of Denak! Defenders I#73: Exclamation: Demons of Denak! Doctor Strange II#45: Exclamation: Demons of Denak! Defenders I#98: Exclamation: Demons of Denak! Defenders I#100: Exclamation: Demons of Denak! Necromancy: By the Demons dire of Denak, by the flames from Faltine torn,by the scarlet night of Draggus, let Mordo be reborn! e faccia cessare questo canto! and let this singing no more be! Dottor Strange II#60: Exclamation: Demons of Denak! Doctor Strange II#75: Exclamation: Demons of Denak! Doctor Strange II#78: Exclamation: Demons of Denak! Doctor Strange II#80: Exclamation: Demons of Denak! Strange Tales II#4: Exclamation: Demons of Denak! reveal the foe at the Mirror's back! Agamotto be now hurled back! e che la mia magia possa scagliarli per sempre nei reami oscuri del terribile Denak! and let my magic hurl them in the dark realms of the dreadful Denak! let night's shadow now enfold and slay! Hear now these words: let my fate be my own! Doctor Strange & Doom Triumph and Torment: Exclamation: Demons of Denak! Graphic Novel: What is it that disturbs you, Stephen? : Exclamation: Demons of Denak! Defenders II#1: Exclamation: Demons of Denak! Defenders II#3: Exclamation: Demons of Denak! Defenders II#5: Exclamation: Demons of Denak! Defenders II#8: Exclamation: Demons of Denak! fill my limbs till I'll draw all my enemies' blood. and my debt I'll pay, with a river of souls' flood. any other character with a similar name. The Demons of Danak lived in the farthest reaches of the Universe. Their shape and form higly varied from demon to demon so, they could show humanoid, reptilian, amphibian or invertebrate traits, they had tentacles, eyes, protrusions, scales, tails, fur, fangs and teeth, their bodies were of a substance alien to the human description. Their only touch resulted extremely chilling, astonishing, on a human being, and their continuous, peculiar shrieking was almost unbearable for the human mind. Their intelligence was at an animal level and acted upon basic instincts. 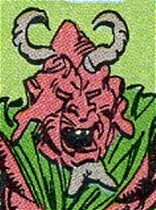 The Demons of Danak were summoned on the Earth by the evil mystic Kaluu. They were an horde, and were hurled against Dr. Strange and the Ancient One in an attempt to slay them. The demons were sustained by Kaluu's force of will, but after they passed the barrier that surronded Strange's Sancta Sanctorum, they lost the telepathic contact with Kaluu, losing also his power, even remaining lethal. One of them was enwrapped by Strange's cloak of levitation, but it easily escaped, thanks to its melting form. However, a banishing spell, using the light of the Amulet of Agamotto, helped by the Shades of the Seraphim, overwhelmed and dissolved them.